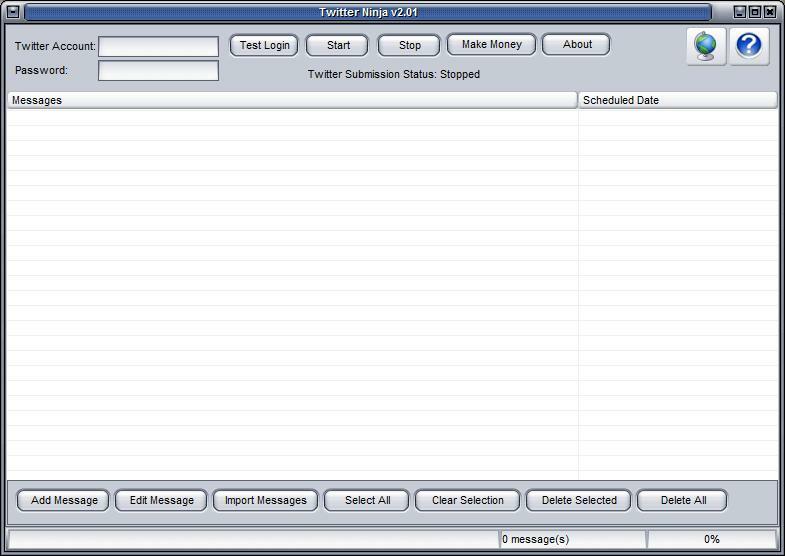 Twitter Ninja is an effective, easy-to-use desktop application which allows you to not only make multiple posts on twitter, but also set a schedule for your Twitter posts so all your posts are automatically uploaded on autopilot! You can also edit your messages and make changes anytime you want in seconds without logging on to Twitter.Think about the time saved on making changes without having to log into Twitter! ...... posts in just seconds easily! * Set the time, edit and import messages in just a few clicks of a button! * Think about the time saved on making changes without having to log into Twitter! * Gain rapid exposure through Twitter without having to physically be involved in tweeting all day! NTI Ninja is an exciting software that maximizes data protection. The army of best ninja fighters is about to attack you! Qweas is providing links to Twitter Ninja 2.01 as a courtesy, and makes no representations regarding Twitter Ninja or any other applications or any information related thereto. Any questions, complaints or claims regarding this application Twitter Ninja 2.01 must be directed to the appropriate software vendor. You may click the publisher link of Twitter Ninja on the top of this page to get more details about the vendor.